This page forms part of Dr Peter Harries’ first PhD thesis submission entitled: “From Local ‘Live’ Production Houses to Relay Stations: A History of Commercial Television in Perth, Western Australia 1958-1990″. This contained much additional material. This chapter concludes the examination of the inextricable melding of Television Audience Survey Ratings, Financial Returns and Local ‘Live’ Production. While there was still intense rivalry between TVW7 and STW9, other forces were coming into operation in the succeeding period from 1981-1990. In this decade both TVW7 and STW9 were subsumed by much larger corporate entities. At the level of programming this led to a notable decline in local ‘live’ production, as a result of national networking and a corresponding diminution of community responsibility. During this period there were to be big changes in the structure of what can be termed the era of the two ‘family television’ companies in Western Australia. The chapter examines the events that led to TVW7 becoming part of the Robert Holmes a’ Court Bell Group, the retirement of Sir James Cruthers (considered by many to be ‘the Father’ of Perth television) and the sale of STW9 to the Bond Corporation. Another development, the introduction of the Aussat Satellite System was to have a huge impact on program transmission and in conjunction with Networking, perhaps deliver the mortal blow to the local ‘live’ television industry. The chapter concludes with the first two years of a three-station System in Western Australia’s capital city, when NEW10 went on air in 1988. 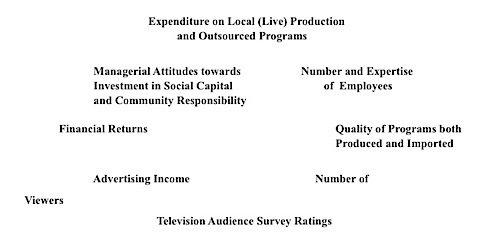 Examination of the correlation between audience ratings surveys and Company profitability continues and so are their combined deleterious effects upon the former showcases of the two original stations, their respective Production Departments and the wealth of output from their in-house studios. In the Twenty-Third Directors’ Report TVW7 1981 full-page colour photographs were the order of the day and one showed Sir James Cruthers with Garry Meadows and others at the station’s 25th Birthday Party, the TVW7 helicopter with the Newscruiser camera-crane truck, Sir Charles and Lady Court arriving to open Cinema City, Lionel Yorke on Yorkie a short-lived variety program. ‘Cop Shop stars John Orcsik and Paula Duncan with jockey Mick Gorham after he had won the $250,000 Channel 7 Australian Derby at Ascot Racecourse’, ‘Singer Normie Rowe on camera at SAS Channel 10’s Adelaide Studios’ and the TVW7 Hole-in-One day, shot from the air. Apart from the Yorkie photograph the promotion was for imported ‘stars’, station activities, pursuits outside of television production and acknowledgement of community service involvement. Net profit had risen by 6.5% to $4.53 million and the Group had acquired a 30% holding in the Albany Advertiser Moves were also announced to acquire all of the issued capital in Western Mail Ltd., while ‘significant strategic holdings’ were acquired in Herald and Weekly Times Ltd., and John Fairfax & Sons Ltd. The Group had also acquired a 21% interest in the giant UK media and entertainment conglomerate Associated Communications Corporation Limited. In 1971 TVW7 Limited began an expansion program following on from when it became a truly independent Company. This followed the action of the Melbourne based Herald and Weekly Times Limited divesting itself of a long standing holding in TVW7 by West Australian Newspapers. Sir James Cruthers said that the holding was 44% representing the 3/7ths control of the original share issue. In 1971 James Macartney ‘retired’ as head of West Australian Newspapers Limited and Goss White took over as Managing Director. According to Cruthers, in 1971 the Board of TVW Limited became aware that the head of Sydney’s Consolidated Press, Sir Frank Packer was interested in taking over West Australian Newspapers Limited. Because of the Broadcasting Act 1942 ruling that no person could control more than one television station in Australia, the 44% holding would have to be divested by Packer and TVW7 would then be open to a control bid. To counter this contingency, the Board of TVW Limited proposed a reverse take-over of West Australian Newspapers Limited, endeavouring to ‘keep it all local’. This proved to be not acceptable to the newspaper group. Sir John Williams, the head of the Herald and Weekly Times Group in Melbourne had given an undertaking to the Board of W.A. Newspapers that he would protect them from Packer and to that end made an offer of $5 a share which was accepted. However, this placed the new owners (who also controlled HSV7 in Melbourne) at odds with the ‘two station’ rule and a controlled divestiture was formulated. With the connivance of a ‘friendly’ Melbourne stock-broking firm, the 44% was placed with a disparate group of institutional buyers such as the AMP Society and Colonial Mutual Assurance. The new shareholders were limited to about 5% each of the TVW shares. In the mid 1970s Robert Holmes a’ Court, operating through the Albany Woollen Mills started to build a small stake in TVW. According to Binks, when this information became known to the TVW Limited Board of Directors they operated to thwart him in the market, with ‘friends’ acting to curtail Holmes a’ Court’s purchasing activities in TVW. Because of his reputation as a corporate predator he was not a welcome newcomer to the share list. Sir James Cruthers said that the first part of that information is arguable, as Binks did not attend TVW7 Board Meetings.At this time TVW shares were selling at $2.25. The ANZ Bank was at $5.10; Bank of NSW $2.90; National Bank $2.70 and Bell Group $4.20. The R & I Bank were offering interest rates of 6% at call, 12% for 30 days and 12.75% for 3 months; Perth Building Society 13.5% for 12 months; Resources Bank 15.75% for 10 years; General Credits 15.75% for 3 years and Perpetual Trustees 15% for 3 months. At this time Rupert Murdoch (through News Limited) in the role of a ‘White Knight’ purchased a holding of about 5% in TVW7. At the same time Murdoch was making moves associated with Ansett Transport Industries (in which he held a 5% stake) to gain a greater stake in Melbourne’s Channel ATV10. As part of this he wished to acquire the Bell Group’s 10% interest in Ansett Transport Industries. Murdoch and Holmes a’ Court met in Melbourne in October 1979 for a weekend at Murdoch’s property Cavan. In a share swapping arrangement, Holmes a’ Court came away with Murdoch’s 10% interest in TVW and Murdoch acquired the Bell Group interest in A.T.I., subject to approval of the Australian Broadcasting control board. Although Binks said that many were surprised when Sir James invited Holmes a Court to join the board Cruthers said that this did not happen and that the Board had little choice as 15% is considered to be a ‘substantial’ holding in any company, and acceded to Homes a Court’s request for a seat on the Board. In March 1987 a Senate Select Committee recommended that the ‘two station’ rule be abolished as part of a total replacement of the old Broadcasting Act 1942 which had become a legal minefield. ‘The broadcasting Act 1942 was introduced to regulate radio services and was amended to include television services in the 1950s’ This would be replaced by the Government implementing its proposal to introduce a rule restricting the maximum permissible audience reach to 75% of the Australian viewing audience (para. 1.80). When the Law was changed the percentage of allowable market was reduced to 60%. The other major recommendation was that the Government should proceed with its plan to introduce rules limiting cross-media ownership. The legislation was introduced soon afterwards and the rules would prohibit the ownership of more than one commercial television licence, one radio licence or a daily (at least four publications per week) newspaper in the same licence area. Ownership of any Australian Commercial Television Station by foreigners was limited to 15% for a person and total foreign ownership in any particular station was limited to 20%. Because of the changes to legislation, when the Bell Group acquired a majority holding in West Australian Newspapers in 1988, they were forced to divest themselves of TVW7. The new owner was the Christopher Skase Qintex organisation which had just purchased Channel Seven in Sydney, Melbourne and Brisbane, so a true network was created. Those three stations were sold to Quintex by John Fairfax Ltd in April 1987 for $780 million, a profit of more than $300 million within one year of their purchase When that structure imploded, control of the oldest and most profitable of Western Australia’s two commercial television stations was taken over by receivers for lending institutions (mainly Australian banks) and finally, in 1993, a consortium headed by Kerry Stokes became the operators of the national Seven Network. Apart from Flapper’s Super Heroes on Saturday and a special called Kids on the Block, a puppet film designed to show the problems of handicapped children, there was little for STW9 to boast of concerning studio local ‘live’ in the Eighteenth Annual Directors’ Report STW9 Limited 1981. However, the station was busy in local live production of sporting events. There was a significant increase in the coverage of local sport including Australian events with Sheffield Shield Cricket, W.A. Open Tennis, The Nedlands Masters, The Halls Head Open Golf, W.A. Masters Ten Pin Bowling, The Narrogin Three Day Event, Golden Gloves Boxing, Champion Footballer of the Year Awards, W.A. Sportsman of the Year and the Rothmans Soccer Gold Medal Awards. The claim was made that STW9’s was the top rating News Bulletin at 6 o’clock each night. As well, although no ratings figures were claimed (except by inference) six bulletins went to air each from 10 a.m. to 8.30 p.m., with a half hour bulletin at 11.30 a.m. In April 1981 STW9 became partners with the publishing company established by Richard Keech and John Kershaw . They produced various Perth based magazines including ‘ “About Homes” and “Girl About Town”. It was reported that ‘Company net profit after income tax and all provisions increased 24.3% to $1,675,000… maintaining an acceptable steady annual growth rate.’ The dividend for the year was 20%. Swan Television shares were trading at $2.90 and they had overtaken those of TVW Enterprises Limited for the first time The fact that overall operating costs had risen by 28.9% was attributed mainly to the rising cost of programs. TVW7 had forecast that this would happen with the abandoning of the buying cartel, but general inflation was also a contributory factor. Another major reason for increased expenditure was the use of the broadband link with the Eastern States, which had risen 1200% in four years. An explanation of the station’s adherence to the Australian Broadcasting Tribunal’s directions was given. Under the current ABT points system we are required to achieve 6288 points for the year, whereas the station achieved 12,136 points – almost twice the minimum requirement. Similarly we were required to telecast 104 hours of first run Australian drama during the year, whereas in practice 326 hours were put to air – over three times the minimum requirement. The introduction of the Points System was another of the continuing addendums to the Broadcasting and Television Act 1942. When television commenced in 1956 it was regulated by section 114(1) which instructed operators to employ Australians to the greatest degree in production and presentation areas. After three years of operation the first Government instructions regarding programming were promulgated, requiring Australian content of at least 40% which rose to 50% in 1965. Stations had to telecast one hour weekly (rising to 2 hours after 1962) of material produced in Australia, between 7.30 and 9.30 p.m. The regulatory body was the Australian Broadcasting Control Board which became the object of criticism following a Senate Select Committee in 1963. 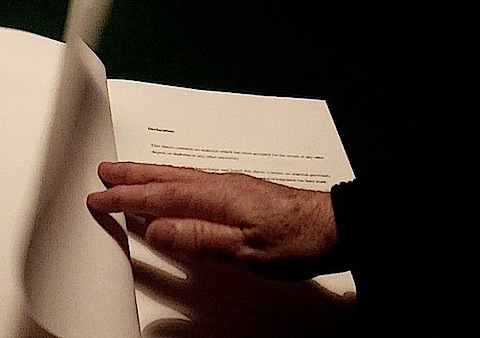 This, the Vincent Committee criticised the small percentage of Australian production content on commercial television and the deleterious effects on Australian culture. An adjunct was the lack of opportunity for local talent in all creative spheres. By 1971, televised content had to be 45% (increasing to 50% in 1972) during prime time. A minimum of six hours of Australian produced drama was to be aired during each four week period. As well, in the same period the stations were required to show four hours of Australian content during viewing times for children of school age. Radio 6KY and Swan Hauliers continued to provide profits to the Company. Perhaps in response to the momentous changes which had occurred at TVW7, the report closed with a virtual Philosophy which set out to consolidate and restore faith (in the perception of shareholders and staff) in the continuation of STW9 as an independent entity. Our principal obligations and responsibilities remain the same and have not altered over the years. We must fulfil our obligations under the B & T Act and the licences granted to us by The Australian Broadcasting Tribunal. These include very precise responsibilities. We have always been very clear in our mind on these responsibilities to the community we are licensed to serve, our shareholders, out staff and our clients. We believe we are fulfilling and will continue to fulfil our obligations to the community and see our involvement always continuing. We hope to achieve the reasonable expectations of our shareholders and believe this has been done and will continue to be done. We have created and will maintain security for our employees and provide opportunities for them to fully develop their talents. We strive very hard to serve the interests of our clients and customers and to anticipate their future needs. We value and appreciate their support, without which the company could not progress. In short, we wish to remain a healthy, strong enterprise serving the needs of our community, shareholders, employees and customers. We go forward into the future with confidence. With the era of ‘family’ television ended ‘up the hill’ at TVW7, it would not be long before the STW9 would be subsumed by corporate greed. The lofty ideals so eloquently expressed by the Annual Report would have to bow in the face of economic pressures. Excepting ‘passport’ photographs of executives David Aspinall, Len Downs, Vance Lothringer, Tony Barrett, Vern Stone, Michael Kiernan, Richard Keech and Bruce Walker the issue was devoid of illustration. TV1 1981 would have brought great consternation to the TVW7 Boardroom when its opposition picked up the first seven places in the Top Twenty and a total score of thirteen! Seven’s only consolation was winning the News on Wednesday with 198,000 viewers at No.8. 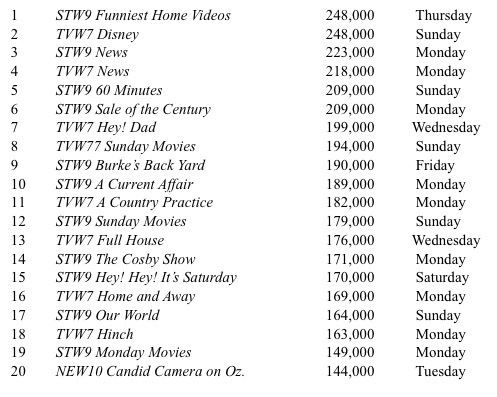 STW9’s new shows Sale of The Century was No.1 with 277,000, Paul Hogan at No.7 with 204,000, New Faces from GTV9 Melbourne was No.11 with 176,000, No.17 was The Dukes of Hazard with 149,000. M*A*S*H was waning at No.20 and 148,000 viewers. 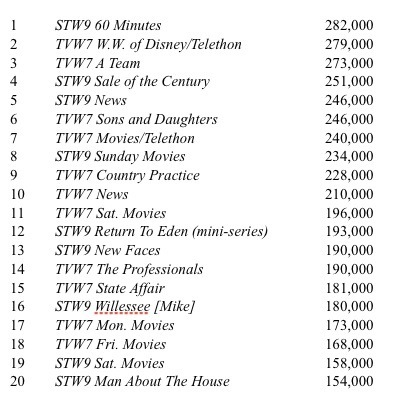 TV2 1981 still showed STW9 with thirteen of the Top Twenty with 60 Minutes back at No.1 with 311,000 viewers. Appealathon rated equal sixth place with New Faces on STW9 both with 211,000, while their new Buck Rogers in the 25th Century gained No.7 with 202,000. ABW2 claimed No.16 with To The Manor Born and 172,000 viewers. STW9 consolidated its advantage in the next round of ratings where it recorded thirteen of the Top Twenty including the coveted No.1 position with their News and 312,000 viewers on a Monday. TV4 1981 increased the advantage of STW9 with fourteen of the top twenty and Nine’s News still holding No.1. Ford Superquiz coming in at No.9 with 216,000 viewers added to their success. TV5 1981 showed that TVW7 had clawed back three positions with new shows That’s Incredible at No.9 with 211,000, The Leyland Brothers at No.16 with 187,000 and Chopper Squad at No.20 with 185,000 viewers. TV6 1981 had both stations again on equal terms with TVW7’s M*A*S*H and Telethon sharing No.2 spot with 262,000 viewers, Seven’s News was back on top with No.4 and 246,000 Wednesday viewers and The New Price is Right coming in at No.13 with 201,000 viewers. Telethon rated 33. By TV7 1981 TVW7 had gained another place to be 11 to 9 in the Top Twenty. There were six new programs. In the Twenty-Fourth Directors’ Report TVW7 1982 the only picture referring to local ‘live’ production was a photograph of Miss West Coast 1981 with TVW7 presenter Debra Allanson and compere Lionel Yorke. The frontispiece was a full-page colour photograph of the Telethon set with ‘The Chairman, Mr. M.R.H. Holmes a’ Court, at the opening of Telethon 1981.’ To illustrate that TVW7 was now out there with the big boys, the photographic content included pictures of Henry Fonda and Katherine Hepburn from the Associated Communications Corporation Limited’s film On Golden Pond; Kevin Kline and Meryl Streep from ACC’s film Sophie’s Choice; Michael Crawford in Barnum at the London Palladium; Dennis Waterman in Windy City at the Victoria Palace, a scene from Pirates of Penzance at the Theatre Royal, Drury Lane, and Perth’s Grand Theatre in the 1930s. On page 50 there was a picture of TVW Channel 7’s Logie Award winners, Newsreaders Rick Ardon and Ann Sanders’. This was a precursor to News on both commercial channels becoming the virtually the sole representation of local ‘live’ production. The Report mentioned that, ‘The Channel 7 news team won the 1982 national Thorn and Penguin awards for the best news coverage of the bulk-ore carrier Co-op Marine, which ran aground off the coast at Port Hedland, W.A.’. Photographs in this issue were of ‘The winner of the Caltex Sports Star Award Terry Alderman with compere Gary Carvolth; TVW7 telecasts the Caltex Sports Star Awards.’; ‘Crowds at Channel 7’s fund raising Teddy Bears Picnic’ and a full-page picture of Miss Piggy from ACC’s Muppets Show. The Perth market for commercial television experienced strong growth during the financial year and Channel 7’s rating performance improved very significantly from October 1, 1981 onwards. The average overall ratings achieved by TVW Channel 7 during the past 12 months was 44% of Perth’s viewers compared with 42.4% achieved by the channel’s commercial competitor. TVW 7’s locally produced news and sporting programs, and the Seven Network’s Australian production received strong and consistent viewer support. While making mention of ‘locally produced news and sporting programs’ other Australian programming was attributed to out-of-State sources. Apart from a reference to the Today program, no mention was made of any other local ‘live’ production. By this time the effects of the ‘points’ system of regulation had decimated production of local programs in Perth. The requirements could be satisfied through the affiliated networks in the Eastern States. Said that local ‘live’ had one representation as The Young People’s Department was producing Perth Young Entertainers designed to give ‘…the experience of participating in a professional television program.’ The only other contribution to ‘in studio’ local ‘live’ production was Kids Cartoon Sundae a pre-recorded program shown on a weekly basis. However, in the area of ‘Specials’, STW9 was much more involved. Guy Baskin had produced The Wonders of Western Australia, two wildlife and natural attractions documentaries. The News Department was the busiest at the station with the 6 p.m. bulletin with Russell Goodrick, the 11.30 a.m. News Report, Greg Pearce and Valerie Davies and a half hour late news session The World Tonight with Terry Willessee. Film Unit One under John Izzard was making a 10 part children’s series called The Little Outcasts. As well, the unit had completed two wildlife programs. One dealing with the migratory Siberian wader birds and the other a study of the Rowley shoals, 160 miles off the North West coast near Broome. Channel Nine Management was very amenable to requests for funds to spend on programs which had the potential to be sold interstate or overseas. Sport was well catered for with coverage of the Sheffield Shield and International cricket, W.A. Golf Championships, The Nedlands Masters Golf, The Halls Head Western Open, The W.A. Amateur Ladies Amateur Golf Championships, W.A. Open Tennis Championships, Golden Gloves boxing, Ten Pin Bowling Championships, Coca-Cola Junior Sports Star of the Year Awards, Channel 9 Golden Nugget Pacing Championship, N.B. League Basketball, Narrogin 3-Day Horse Trials and the Australasian Polo Championships. Overseas contributions were Wimbledon Tennis, The U.S. Open Tennis, The British Open Golf, The U.S. Open Golf, The U.S. Masters Golf and Formula One Grand Prix Racing amongst others. STW9 reported that the points total required for the year in regard to Australian content was 6,544 and they achieved 14,429. In the area of first-run drama, 315 hours was telecast, in excess of the 104 hours required. The 4.75 hours of pre-school programming was more than the statutory 2.5 hours. The ‘C’ classification requirement covering the 4-5 p.m. timeslot for children aged 6-13 was met with 5 hours per week. With the necessity to produce four ‘one-off’ high budget drama or variety specials, the station achieved a total of six. . The illustrations in the report were a two-page colour spread featuring four of the events named above as having been direct involvements; a studio shot of Perth Young Entertainers; STW9 News on-air team and a huge Swanline triple trailer road train en route to the North West. It also was noted with some degree of satisfaction that the prospect of advertising on the A.B.C., which had been recommended by the Dix Report had been rejected by the Government. On the matter of pay television the company once again protected its position and urged the Government not to hurry into this area. In the April-May 1982 Ratings, Appealathon rated 51 on Sunday evening but didn’t show up in the top twenty programs. A new local ‘live’ program, Perth’s Young Entertainers was introduced to Saturday audiences, rating 11,16 against TVW7’s 6 Million Dollar Man repeats with 11,15. Telethon did very well once again at No.2 with 258,000 viewers. Despite the continuation for a requirement to transmit Australian product, the preferred programs as shown by the ratings were in the main American. Nineteen eighty-two started well for ABW2 who had immediate success with the classic British comedy Faulty Towers coming in at No.6 with 237,000 viewers. They also had To The Manor Born at No.10 with 220,000 viewers. Two new shows were on STW9, Greatest American Hero at No.17 with 175,000 and Different Strokes at No.19 with 171,000 viewers. TV3 1982 had STW9 with six of the Top Ten and the only new program was Sara Dane on TVW7 at No.12 with 211,000 viewers. TV4 showed that while 60 Minutes still held No.1, TVW7 News was No.2. Some Mothers Do ‘ave ‘em came in at No.11 for ABW2 with 213,000 and they also had A Fine Romance at No.17 with 195,000 viewers. TVW7 had The Professionals in at No.19 with 190,000. M*A*S*.H was at No.20 with 189,000. STW9 had seven of the Top Ten, ten in total, TVW7 had eight and ABW2 two of the Top Twenty. TV5 1982 showed TVW7 with ten, STW9 with nine and ABW2 with one of the Top Twenty. The final survey for that year had the commercial stations equal with ten each. The TVW7 Annual Report 1983 had only one page devoted to TVW7 with a photograph ‘Production Control Room at Channel 7, Perth Western Australia’ showing long time Director Phil Booth and a small photograph taken at the close of Telethon. Local ‘live’ production was virtually a thing of the past. In 1983 the annual report was that of The Bell Group Ltd, their 61st which revealed that the profit from television, radio and publishing was $3,991,000. TVW Enterprises Limited as a separate entity was no more. Bell Group shares were at $4.75 and the Bond Corporation was listed on the Stock Exchange with shares trading at $1.34. Other comparative shares were ANZ Bank at $3.46 and National Bank at $3.22. Interest on investments were still high with British Finance offering 14.25% debentures; the R & I Bank 8% at call and 12% for 3 years. The Twentieth Annual Directors’ Report STW9 Limited 1983 recorded that during the year STW9 ‘…continued our strong commitment to locally produced programs.’ In contrast to the lack of participation by TVW7, this year had been a quite good one for local ‘live’ production on STW9. As well as continuing with Perth Young Entertainers the station also produced a juvenile game show called Clash of The Creatures and The Squirrels Club also provided an avenue for the participation by an audience. John Izzard’s Film Unit One was working on a Rottnest Special and his eight-part series Land Looking West had been completed and put to air. Guy Baskin produced two more specials on the Wonders of Western Australia plus the story of the North West Shelf Oil Development, a documentary entitled Born in Fire. Eight episodes of a senior talent quest The Entertainers were produced, plus a two-hour final, ‘…giving aspiring Western Australian talent the opportunity of gaining television exposure and experience.’ Lotto and major Lottery draws were telecast during the year, as were Mrs. Australia W.A. Quest, Summergirl, Rothman’s Soccer Gold Medal and the Coca-Cola Junior Sportstar and Sportsman of the Year Awards. A combined appeal for victims of the February 1983 South Australian Bushfires, between STW9, TVW7, the GWN Network plus the local newspapers raised $1,653,722 during a three-hour period. Sport continued to be the dominating area of telecasts. This was to be the final annual report of Swan Television Limited as it had existed since its inception. Despite the fact that net profit was down 10.7% on the previous year, the shareholders still benefited to the extent of a 20% dividend. Swan Television shares had risen by 65cents in the twelve month period to $3.55.The profit figure was still $1,842,000. It was recorded that program costs had risen 59%. TW9 was so sure of their position that they published these ratings figures in their Report. Once again, in all departments STW9 exceeded the requirements for minimal Australian content as laid down by the A.B.T. Long time TVW7 News-reader Peter Waltham had been lured ‘down-the-hill’ to STW9 with a ‘six-figure sum’. During the ratings survey TV6 1983, the America’s Cup Victory Parade was shown by all three channels with the surprising result of TVW7, 9, STW9, 11, and ABW2 victorious with 22. 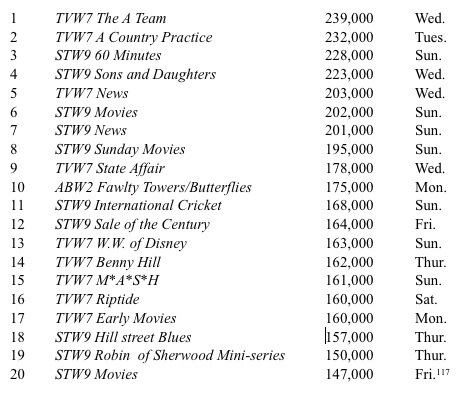 STW9 had begun televising the cricket and on that same Sunday it rated 15,18 against TVW7 movies at 5,6 brought a welcome change to the hierarchy of TVW7 when M*A*S*H and Telethon topped the ratings with 265,000 viewers. Once again the commercial rivals shared the Top Twenty with TVW7 and STW9 scoring eleven and nine respectively. TVW7 News was at No.2 and their main opponent was at No.3. 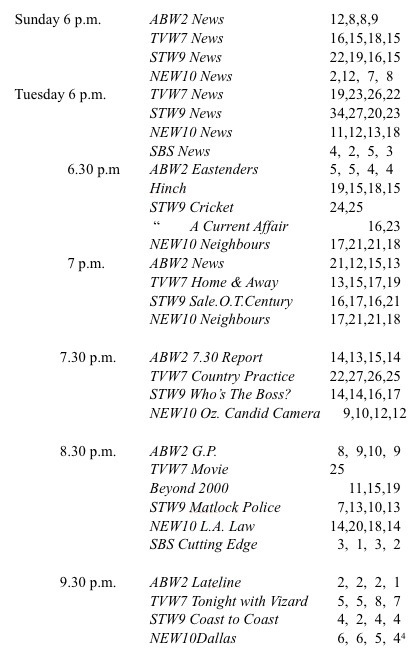 New programs TV Censored Bloopers was at No.6 for STW9 with 227,000 viewers, All The Rivers Run an Australian mini-series was at No.9 for TVW7 with 212,000. TVW7 Annual Report 1984 showed that profit contribution from television and radio was $4,176.000. [This was the only mention in the Bell Group’s publication for that year.] Bell Group shares were steady on the Stock Market at $4.70. The ANZ Bank had gained $1.50 to $4.82. Geneva Investments were offering 14% for 12 months; United Credit 11.35% at call and Beneficial Finance 13% for 3 years. It was a good time to have ready cash, but not many investors were in that position. On the first page of this glossy, photo-filled publication, a beaming Alan Bond welcomed STW9 to the Bond Corporation. The Chairman’s address acknowledged that the company was ‘…vigorous and innovative…’ Bond Corporation shares were at $1.45 on the Stock Exchange. It was indicated that the strong management already in place [David Aspinall had been appointed Managing Director] would continue. The first responsibility of the station was to bring the outside world to this State, one of the most isolated parts of it and the second intention was to take Perth to the outside world. This referred to the trigger which brought about the change of ownership of STW9, the America’s Cup which had been wrested from the Americans in September 1983. Dennis Cullity remembered watching that event. Negotiations had been in progress since late in 1982 to dispose of the company and on the morning of the final race, when the puff of smoke signalled that ‘Australia II’ had won, ‘…my wife and I danced around our lounge room because I said, “He can’t afford not to buy it now! His ego will be such that he must buy it!” ’ Cullity was referring specifically to Alan Bond, one of those with whom he had been conducting overtures regarding a potential corporate take-over of STW9. The review was devoted to ‘selling’ Western Australia; dedicated to promoting Channel and Radio 6KY in text and pictures; outlined the technological capabilities of the system to be used in conjunction with the intended Aussat satellite and was totally devoid of any financial information regarding the parent company’s operation. There were pictorial representations of Perth, the North-West Oilfields, the Wheatbelt, local studio productions The Entertainers and Flapper’s Fun Factory, the local News Team, sporting events, Appealathon, videotape machines, a jubilant ‘Bondy’ with the Cup on Perth Esplanade, artists impression of the Aussat launch and the Executive Staff of STW9, Channel Nine Commercial Production and 6KY. With exception of ‘Julie Marr Sales’ the twenty-two persons were all male. Television is in the control of the child audience with parents available intermittently until about 7.30 p.m. From this time the mother is thought to control the television, which functions for the next 90 minutes as a focus for the family. After 9 p.m. when the rules on content are strict, children’s viewing is seen as the responsibility of the parent. Control of the television set is shared between adults with the father assumed to take a much more central role in determining programme source. Similarity would be found to exist in Australia. The inquiry in 1968 also surveyed adults in Sydney regarding programmes found to be embarrassing or in poor taste. Federal Government regulation of requirements for ‘C’ Children’s Classifications was up-dated in 1983. The Television Program Standards, as part of the Broadcasting and Television Act (1942), were written for the introduction of the medium in 1956. In 1983 it was noted that only minor amendments had been made since then. encompass themes which might cause upset to children such as ‘horror, excessive violence, morbid sound effects etc.,’. To a large extent the television stations were expected to be self regulated and while particular content was not stipulated, ‘C’ programs were expected to be informative, educational and entertaining. The second ratings period of 1984 included Appealathon which rated equal No.3 on STW9 with 244,000 viewers and a top of 45. TVW7 started State Affair, a new current affairs program which came in at No.18. STW9 were doing a one hour News against this which occupied No.5 position. TVW7 News was behind on No.8. Sharing No.20 were the ABW2 programs Yes! Minister and A Fine Romance both attracting 169,000 viewers. TV3 1984 showed another News swing with TVW7 back on top at No.5 with 241,000 followed at No.6 by STW9 with 230,000 viewers. State Affair had risen to No.15. TV4 1984 belied the theory that the ‘sling-shot’ effect of one program helped or hindered that which followed. STW9’s Different Strokes with 12,14,14,17 lost to TVW7’s The Price Is Right 24,19,23,22 but the following News programs showed 35,37,32,31 for STW9 to 36,32,38,21 for TVW7. A Torvill and Dean skating program returned a figure of 39 for STW9. On Saturdays Perth’s Young Entertainers was earning its spot on STW9 with 14,14,14,13 to TVW7’s TRAX with 6,9,7,9. The ‘sling-shot’ formula was apparent here with 29,28,27,29 to 16,22,17,16. The Annual Report ignored the activities of TVW7. Bell group shares were at a high of $11.40. ANZ Bank was also at $5.16 and National Bank were $4.80. Interest rates on investments included Ford Credit 14.75% for 2 years; Fremantle Credit Union 16.5% for one year and R & I Bank 14.67% at call. One year later in the Swan Television & Radio Broadcasters Limited, The Year in Review 1985 Alan Bond congratulated the Station with ‘…pride and satisfaction…’ that this ‘…volatile and sometimes violent industry…’ had continued with its ‘high level of success…and…high level of technological excellence…to be recognised as one of the best equipped stations in the Southern Hemisphere.’ Bond was glad that the company was not suffering from ‘…a total technology phobia…[ but was]…extremely conscious of the diverse needs of those living within its license area and continues to cater for them not only through news, information and entertainment, but with direct service and community involvement.’ Bond Corporation shares were available on the Stock Market at $2.06 up 61cents in twelve months. In the Managing Director’s Report, David Aspinall applauded the company’s ‘crystal ball-gazing’ which had kept it up to date on the ‘techno’ front; claimed 50% of both the Commercial Market and the Commercial Audience; observed that the past twelve months had seen a ‘narrowing and a volatility’ in viewers’ tastes which should preclude the issuing of another Commercial License for Perth; concentrated on News services; devoted resources to telecasting sport and award nights [Aspinall did not mention other local productions except those instigated in past years] and established a subsidiary to buy and operate Airships. The Bond Corporation Holdings Limited Annual Report 1985 was a re-write of the STW9 report emphasising the opposition to a third licence, stating that they were the only 24-hour television service in the State. There were no specific claims of Community Service. Packer World Series Cricket proved to be a winner for the Nine Network. TV2 1985 showed that TVW7 had replaced their live morning production The Late, Late Breakfast Show and presenter Ted Bull, with Perth Today featuring Jenny Seaton the former STW9 Presenter. It fared badly with ratings of 1, 3 against The Streets of San Francisco on STW9 with 2, 5, but still attracted good advertising content. STW9 News which followed at 11 a.m. rated 3, 6 and TVW7’s Eleven A.M. showed figures of 2, 5. As already stated, although not many viewers wanted morning television, the advertising returns were good for TVW7, so they persisted with its presentation in various forms for about ten years. ABW2 had two new programs in the Top Twenty at Nos, 8 and 9. They were Mother and Son with 213,000 viewers on a Monday and the British series Minder with 209,000 on the same night. Webster was new on STW9 at No.17 with 168,000 0n Saturday evening. The News results varied with TVW7 dominant on Wednesdays and STW9 on Sundays. TVW7’s current affairs program was well accepted. This was not an anomaly as each night of the week showed comparable figures. Another peculiarity was the fall of 60 Minutes to No.10 with an audience of 242,000. In the TVW7 Annual Report 1986: there was no reference to local ‘live’ production. The accompanying photographs were ‘Chris O’Mara, Station Manager, Jack Beverley, Managing Editor of The Western Mail, Dianne Sattler, Associate Editor The Western Mail, and Kevin Campbell, General Manager Television Operations’. There were also separate photos of Jenny Seaton, Television Hostess; Kevin Campbell, Television; and Jerry Leider, Film Production. In 1986 the Review of Operations Media and Entertainment stated that TVW7 achieved an increase in both revenue and profitability, although program costs had risen sharply. The Bell Group shares were down to $9.70 while ANZ Bank was trading at $5.04 and National Bank $6.20. Interest rates offered were Esanda 15.5% for 3 years; Commonwealth Bank Finance Corporation 11.5% for 5 years and R & I Bank 16.5% at call. It said that TVW7 ‘…has won the last 14 overall television audience surveys.’ and credit was given to the ‘News-State Affair’ hour. As early as 1982 concern was registered by STW9 that provision for “national beam” broadcasting, made it possible for out of State programs to be telecast into the established market area. STW9 was opposed to such a contingency. In 1983 that company recorded that it was opposed to a proposal that a channel for R.S.TV. (Radiated Subscription Television) pay television might be included in the Aussat package. Once again it was said that the advent of the Space Shuttle launched satellite should not lead to centralism. as that organisation was then 100% Government controlled as well, the device was only for internal expediency. Cunningham and Jacka described the advent of satellite communication as ‘The technology that presents us with the next large leap in space-binding and time-compressing capabilities is the satellite; it is the advent of satellite television, which can address a global community in real time…’ A 1984 Australian Broadcasting Tribunal report said that Aussat would increase networking ‘…which offers advantages for a more efficient service.’ and was to be encouraged for that reason. However, the danger of increasing control and influence by Sydney and Melbourne television operators was to be guarded against, as there could be an adverse effect upon culture and information. The Group has built a mobile satellite earth station and two ground satellite earth stations situated in Perth and Adelaide to allow the direct transmission of programs and events all over Australia…The Group was the first in Australia to lease a high-powered transponder on the “Aussat” satellite system for commercial use. Australian Drama, variety, news and current affairs. Consequently the great unofficial story of de facto networks: how they have evolved, despite their absence from the systems of regulation, and the way principles of localism and networking have competed, more and more to the detriment of localism (see O’Regan 1993). The Swan Television & Radio Broadcasters Ltd Annual Report 1986 acknowledged the local production [not by STW9] and televising of the Albert Facey autobiography A Fortunate Life, the commitment to the coverage of the forthcoming America’s Cup in Fremantle, and that there was ‘…a large proportion of sport…’ in its 24-hour programming. This report showed an annual operating profit after tax of $1,521,000 with unappropriated profits at 30 June 1986 being $16,840,000. Radio 6KY had been sold for $5,916,000 to an undisclosed buyer. Bond Corporation shares had gone up 84cents to $2.90. The company now had a commitment to Exploration and Development Expenditure for petroleum exploration with an expected expenditure of $2,007,000 over the life of the intended project. The Bond Corporation Holdings Limited Annual Report 1986 contained only a tiny coverage of STW9’s activities. Once again the vagaries of the viewing public would have been hard for the Program Managers to fathom. Perth Today was now Good Morning Perth but still only rating 1,3 against The Sullivans repeats on STW9 with 2,5. One morning a showing of The Davis Cup TVW7 returned a figure of only 5. The big success for TVW7 in News and Current Affairs programs continued as a result of their changing their format to join STW9 in transmitting their News at 6 p.m. Monday to Friday. The trend was continued throughout the entire week. TV2 1986 showed little change with one new program in for STW9. It was Growing Pains at No.8 with 214,000 viewers. 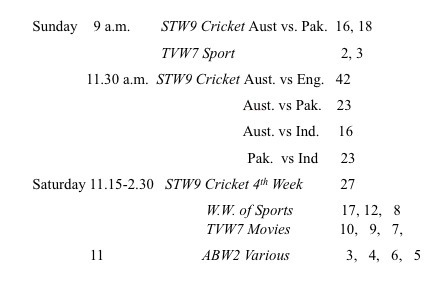 TVW3 1986 was not good for Appealathon when it rated just 23 on Sunday evening before closing against TVW7 News with 33. TVW7 had twelve of the Top Twenty to STW9’s eight. Perfect Match was killing repeats of Hogan’s Heroes on STW9 (which originally ended the good ‘run’ of It’s Academic on TVW7) with 29,35,32,27 to 11,12,14,12. 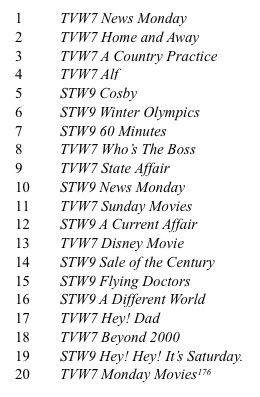 TV4 1986 showed STW9 to have the first three in the Top Twenty but trailing nine to eleven programs overall. Perth’s Young Entertainers had returned on STW9 rating 10,13,13,15, against Disney on TVW7 with 12,15,18,22 and Countdown on ABW2 with 10,10,12,12. Except for Sundays TVW7 News won each night. The anomaly was STW9 24,27,25,32 to TVW7 24,23,25,28. 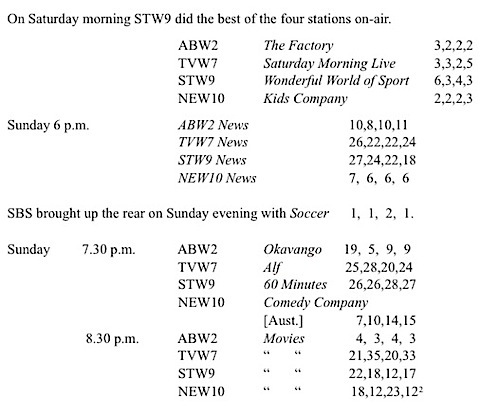 TV6 1986 showed that TVW7’s World of Football was doing 4,7 against STW9’s Sydney program Sunday with 7,6. This was the Telethon survey once again and that program rated 25, falling to No.17 with 173,000 viewers on the Saturday night, however, TV7 1986 which started on the following day scored it 25, at No.5 with 236,000 viewers on Sunday evening. The two television stations, TVW7 and SAS10, continued to perform well relative to their competitors in a period where operating costs for the industry as a whole have outstripped revenue. A third Perth television license has been granted but it is not expected to have an impact in the coming financial year. Bell Group shares were steady for the past twelve months at $10. ANZ Bank was at $5.40 and National Bank were $5.86. Interest rates varied through Australian National Finance 14.25% for 12 months and 11.4% cash. Challenge Bank was lending money for homes at 14.5%. On Saturday 3 October 1987, TVW7 took a full-page advertisement in the Perth West Australian. Huge print announced ‘ AFTER WINNING 21 SURVEYS SEVEN IS NO 1 IN PERTH’. There were two photographs, one of the TVW News team Susannah Carr with Ric Ardon and State Affair with Steve Taylor. The importance of winning the News’ ratings was still being used as the Station’s biggest selling point, consolidating their claim to be the ‘local’ station. Local ‘live’ production was only acknowledged in photographs of ‘Anne Conti, Bruce Walker, Peter Waltham “National Nine News”, “Perth Young Entertainers”, 1987 America’s Cup and “Appealathon 1987” in the STW9 Annual Report 1987. It was a challenge that required one principal element – courage. Courage to act purely on the basis of ministerial statement of intent with legislation being in place. It was felt that in a country where democratically-elected government is strongly advocating change, then that government’s intentions deserve to be recognised and fulfilled. In commerce there is the constant imperative to act decisively to seize and exploit opportunities. Bond Media did that. It acquired the electronic media interests of Consolidated Press Holdings Limited (C.P.H.). The Bond Corporation purchased Packer’s TV Empire for $1.05 billion. It was re-purchased in June 1990 by the original owner for $485 million. One sentence of the opening statement by Chairman and Managing Director Warren Jones said, ‘STW9 has at all times during the year been a wholly-owned subsidiary of Bond Media, and hence its results for the 12 months are reflected in the profits earned by the group.’ Bond shares were hovering at $2.75 on the Stock Exchange. Much of the report on STW9 was regarding the success of its coverage of the lost America’s Cup. It was stated that STW9 won the ‘vital prime-time zones’ in four of the seven ratings periods. The New Year 1987 saw two new programs on STW9. Willing and Abel was No.13 with 198,000 on Wednesdays and The Two Ronnies (having switched from ABW2) was No.16 with 182,000 on Mondays. Clapperboard was still on STW9 at 10.30 p.m. scoring 9,2,16,5. TV3 1987 saw the introduction of a new No.1 with a record number of 381,000 viewers. It was ALF on TVW7, proving that people still loved puppets, even the grosser talking variety from outer space. Are You Being Served was now on TVW7 at No.10 and 229,000 viewers. New show Highway to Heaven was in at No.20 for TVW7 with 179,000. This was the annual Appealathon survey but once again it did not appeal to the viewing public only rating 19 on Saturday night. TVW7 was still leading the News and Current Affairs. By TV5 1987 Neighbours on TVW7 was at No.9 with an audience of 245,000, whilst their Henderson Kids was No.19 with 190,000. Murder She Wrote was No.14 for STW9 with 214,000 on Mondays and they also had the new Flying Doctors at No.20 with 187,000. TVW7 Management would have been jubilant when Telethon rated equal No.1 with Alf and 289,000 viewers, with Who’s The Boss at No.2 with 274,000 and with It’s a Knockout equal No.7 with 237,000, all on the Sunday. Early in 1988 the Bell Group acquired a controlling interest in West Australian Newspapers and this necessitated the divesting of TVW7 to the Christopher Skase Quintex Group. Live At Five also explores a new dimension. Hosted by Terry Willessee and Jo Pearson, it is best characterised as a lifestyle program. In its late afternoon time slot it is a novel development in Australian television – a blend of news, views, trends and advice over a broad spectrum of matters concerning the whole family. Live at Five is innovative programming, designed for an audience dissatisfied with what has been available in the past in this particular time zone. The program has established itself solidly in its first months, and its prime time sophistication and production values are confidently expected to bring prime time ratings and revenue levels to Nine Network stations in this previously fringe-viewing area. With the prospect of added opposition in 1988, Warren Jones said that the granting of the third commercial license presented STW9 with ‘…a unique challenge…’ This was an understatement, as the two existing commercial stations would each face the prospect of losing one sixth of their advertising income. The Chief Executive Ken Gannaway report that the station won the first ratings survey and the News was returned to ‘…a very competitive level.’ Meaning in TV –talk that it was not beaten so badly. Growth of revenue was 13.7%. TV1 1988 showed that STW9 had improved its position marginally although TVW7 still had eleven of the Top Twenty including the first four places. TV2 1988 showed a return to ten each of the Top Twenty but TVW7 had the first five places with A Country Practice No.1 with 278,000 viewers. 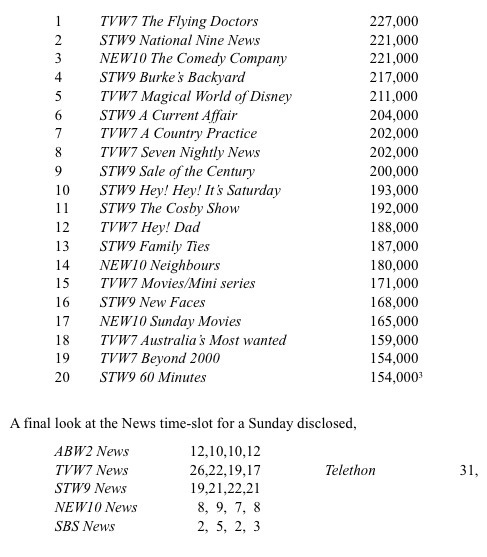 TV3 1988 put TVW7 News back on top with 279,000 plus the next five places. Appealathon did better scoring 30 in this survey with position No.15 and 192,000 viewers. 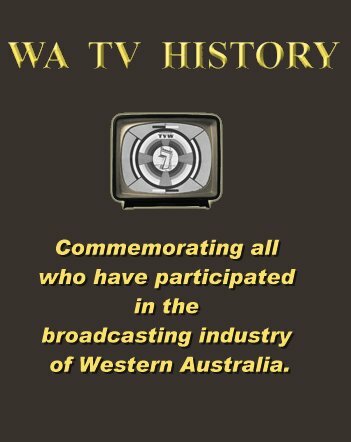 The big change in the whole television scene in Western Australia was recorded in TV4 1988 when the establishment of NEW10 brought Western Australia into line with the other States. This was the only new licence issued in a mainland capital city since the early 1960s. New10 joined the Ten Network proper as one result of these negotiations in the Eastern States. In 1979, News Corporation acquired a controlling interest in Ten in Sydney and Melbourne until 1985 when it sold out to Network Ten Holdings Limited. In 1987, News Corp sold its shares in Network Ten Holdings to Westfield Capital Corp who already owned 20 per cent of Northern Star Holdings Limited. This was followed by Northern Star’s purchase of NEW Perth, ADS Adelaide and CTC Canberra, making the company Australia’s only five-metropolitan-city network. This put the Lowys in charge of the network…The Brisbane station TVQ was purchased in 1989 and all stations in the network changed their frequency signal from 0 to 10 by the same year. The new channel made its first mark with a No.20 position for its Sunday Movies with an audience of 173,000. On Mondays at 2 p.m. they tried a local live program Our Town but it failed to draw with ratings of 1 against The Young and the Restless on TVW7 with 10,11,5,10 and STW9 Movies with 8,7,8,5. It was a rough welcome for the new challenger who did not score a place in the Top Twenty of the following survey. Habit is hard to overcome. There were two new programs, both on TVW7, The Golden Girls was in at No.11 with 212,000 viewers, and they had also picked up the popular To The Manor Born, at No.20 with 172,000. With NEW10 starting an early morning telecast, the others were forced to follow suit. Local ‘live’ production had virtually ceased to be a factor in Western Australian commercial television. The NEW10 incursion into the Sunday night movie audience was cause for concern at the other commercial stations. The TVW7 Monday Movie drew ratings of 13,34, against STW9’s Wimbledon Tennis with 17,15; NEW10’s Movies with 15,9. On Friday at 7.30 p.m. NEW10 started John Barnett’s Collection of movies [a brief introduction and conclusion by the long-time former ABW2 Weatherman] which scored 12,12,10,12 NEW10 did not score a place in the next survey but surprised the opposition in TV7 1988 When their Comedy Company moved up to No.11 with 204,000 viewers. Burke’s Back Yard had made its debut on STW9 at No.16 with 160,000 viewers but 60 Minutes had slipped to No.20 with 155,000. In TV8 1988 NEW10 achieved No.5 with their Sunday Movie and 216,000 audience. They also captured No.16 with Tuesday Movies and The Olympic Games (which showed 20,20 on a Sunday afternoon) with 152,000. In the final survey for 1988 Telethon did not make the Top Twenty for the first time. It was in the ratings book four times, once at 8.30 with 23, at 7 a.m. on Sunday with a score of 17, at 11 a.m. with 17, and at 6.30 p.m. Sunday with 31. TVW7 and STW9 had nine of the programs each and NEW10 had two, the Comedy Company which rated 21,18,24,26 at No.7 with 194,000 viewersand Sunday Movies which rated 19,20,22,34 (Mask) at No.8 with 194,000. On NEW10, John Barnett’s Collection, 4,4,6 didn’t appeal to the viewers against Hey! Hey! 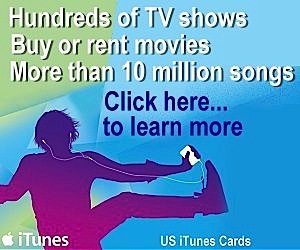 With 15,26,24 on STW9 and the movie Willie Wonka’s Chocolate Factory on TVW7 with 21 and World Around Us with 18,17,16. The STW9 Annual Report 1989 warned that high interest rates were a threat to the viability of Bond Corporation. Commencing with the statement that ‘Electronic Media are intensely personal. They rely wholly on a vast array of human expertise, on and off the air.’ , the Chairman’s Review held dire predictions for the future of Bond Media. There was notation that the huge amount of the loans from National Australia Bank to purchase the Nine Network had been borrowed at 13% interest. This had now risen to 19%. It recorded that STW9 had been sold as required by cross media ownership restrictions for $11 million less than the book price. Bond Corporation had acquired control of West Australian Newspapers Limited which meant that they had to divest themselves of STW9. The purchase of the station by Mrs. Eva Presser involved not only a monetary consideration, but also the ‘swapping’ of the licences for STW9 and STV9 Mildura. Only one other mention of STW9 was the claim that their News had won 7 out of 9 ratings surveys. It was announced that ‘During the year the company acquired 100% of the issued capital of Swan Television & Radio Broadcaster Limited for a consideration of $95,747,535.’ This was financed by the sale/swap of their Mildura TV station to Bond Corp., and other real property. The list of Substantial Shareholders was restricted to one, being Sabtel Pty. Ltd., with 4,588,700 shares. Mrs. E. G. Presser has a beneficial interest in Sabtel Pty. Ltd. There were only another 152,000 shares in the company held by other interests. Mrs. Presser assumed the position of Managing Director with K.A. Gannaway General Manager, R.A. Nicholas Financial Controller and Company Secretary, P.R. Bowen National Sales Manager, J.L. Downs Program Manager, J.E. Rudd Director of News, A.D. Slater Chief Engineer and P.E. Dahl Production Manager. The first year operating profit of $2.096 million had little relationship to the revenue situation at STW9 as it was subject to certain extraordinary content occasioned by various business activities. The General Manager’s ‘Review of Operations’ was a lengthy run-down of current Eastern States programs being telecast by the station. TV1 1989 showed that NEW10 had three programs in the Top Twenty. Comedy Company at No.5 with 197,000, Neighbours had risen to No.12 with 165,000 and their Sunday Movies was No.14 with 164,000 viewers. TVW7 held the top four places and Mission Impossible was on STW9 at No.15 and 160,000 viewers. By TV2 1989 The Comedy Company had gone to No.2 with 224,000 against TVW7’s A Country Practice at No.1 with 244,000. STW9 News had once again returned to the top at No.3 with 213,000 viewers on Monday. 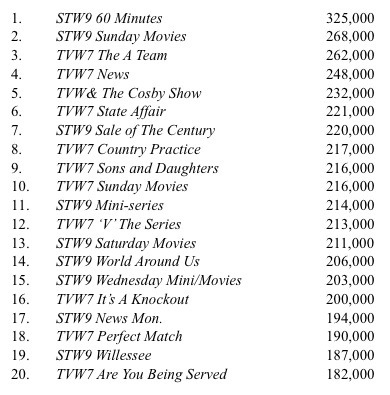 Australia’s Most Wanted on TVW7 had entered the fray at No.13 and 175,000 on Sundays. This was an Appealathon survey and on Sunday it only scored an 11. Finally, in TV6, The Comedy Company gave NEW10 the No.1 spot on the Top Twenty with 243,000 viewers, but only had one other place in Neighbours at No.15 and 174,000. Australia’s Most Wanted had tumbled to No.19 with 163,000. The public debating program of Hinch came into TV7 1989 at No.20 and 153,000. TVW7 was still persisting with Good Morning Perth which only rated 1,3 against General Hospital on STW9 with 1,2 and NEW10 News with 1,3. The Telethon survey returns showed that the former conqueror of local ‘live’ fame, though not in the Top Twenty still rated highly at 31 on Sunday evening. In the Channel 9 Perth Sunraysia Television Limited Annual Report 1990 , The Review of Operation was once again based on the showings of imported, out-of-town productions although a new half-hour magazine at 11.30 a.m. was ‘…strongly supported by local advertisers.’ It is worth finishing this section with this farewell to local production as it once was. The year was highlighted by another successful “Appealathon” which in May 1990 raised over two million dollars. It allowed Perth viewers to see Network personalities in close-up and, most importantly, gave local performers the chance to display their talents. It was to be the last time that this happened, for although Appealathon continued as a charitable institution, the 24-hour telecast was abandoned. Pictorially, Annual Reports used to portray the era of ‘personalities’ as being ‘local’, but finally gave way to ‘imported’ representatives and finally disappeared, to be replaced by photographs of management and technical equipment. The Report announced that the station’s ‘…dominant sporting image was maintained.’ The STW9 Special Unit produced documentaries called Safari to the Centre, An Island Called Christmas and Journey To The South, the News department made The Bottom Line on environmental issues and the Production and Sports Department produced Margaret River Bodyglove Masters and The Avon Descent. Children’s, Women’s and other local ‘live’ had sunk without trace or recognition. The second Sunraysia Report was a little more elaborate with a glossy cover showing various photographs of a cameraman, the O.B. Van, the mobile News gatherer, the News set and a silhouette of a camera crew on location on the front. The back cover was an outdoor shot of the station buildings and three photographs taken inside. The inside cover was a montage of newspaper articles acknowledging the $5.4 million net profit for the year. The Managing Director patted the company on the back for this and for having “WA’s most-watched news service” It was noted that debt had been reduced by $14 million and how pleasing it was that the Nine Network had returned to Mr. Kerry Packer. Children were designated as being under the age of fourteen years. Stations were required to transmit 390 hours per year of C and P (260 C and 130 P). Portion of the 130 hours of C Programs had to be aired each week-day of the year between the times specified above in the C Band, and the other 130 hours anytime at the station’s discretion. Station ‘promotions’ for other G programs were limited to one minute in each 30 minutes, with a C, P or G restriction applying to promotions immediately before or after C programs. News flashed were permitted in C but not in P programs. Presenters of programs were forbidden to endorse products as prizes, mention their value, or describe products except in the most general terms. Stations were obliged to telecast 32 hours of first release Australian children’s drama per year and repeat at least 8 hours of the same. There was to be no more than 5 minutes of G classification advertising in any 30 minute period. Children’s Australian drama shown between 6 and 8.30 p.m. could contain no more than 13 minutes of advertising in an hour and the same advertisement could only be repeated once. The 1990 guide-lines included a ban on advertisements for alcohol; an upper limit of five minutes in each 30 minute period and no advertisement to be shown more than twice in that time; special attention not to mislead or deceive children; advertisements to be clearly distinguishable from the program itself; no program character or personality could present an advertisement immediately before or after the program; the price or value of a prize could not be mentioned; the presenter must not recommend or endorse a product as a prize; [In the period 1965-1968 children’s programs were ‘filled’ with give-aways and prizes which were in part contra and part paid advertising. In 1967 I objected to a range of plastic toys from Hong Kong that were absolute rubbish, both in use and longevity. I was told that my job was to ‘sell’ them and not to criticise! ]; programs were not to demean any group on the basis of ethnicity, nationality, race, gender, sexual preference, religion, or mental or physical disability; [Once again in 1967, I objected to a ‘comedy’ segment on the STW9 Channel Niners Club that was based on the radio series Yes! What!. The setting was a class-room, in which ‘children’ (played by the station news-readers and the program producer) made a fool of the teacher (played by the Production Manager) and generally behaved badly. I considered that it certainly reflected upon the players, as judged by the requirement of the last of the foregoing qualifications!] images reckoned to be frightening or distressing should not be used and unsafe products or situations were not to be screened shown. As well, there was instruction regarding the avoidance of ‘pressure’ and the necessity for clarity. colour; the immediate multiple facility of the communications satellites; networking and miniaturisation of technical equipment. Unfortunately, the technological advances (along with misplaced Federal Government regulation, networking and a diminution of Community Responsibility) had been instrumental in the disappearance of local ‘live’ production in Western Australia. Throughout the 1980s, in the Eastern States, as ‘local’ meant centralised production, the subject of Australian Content rules was a contentious issue. In 1983 the Australian Broadcasting Tribunal commenced an inquiry which, after many decisions having to be made by the Courts, finished in 1989. The by then strongly established networks called for deregulation which was opposed by the entertainment unions. Sunraysia Television Limited, a Victorian company almost wholly owned by Mrs. E.G. Presser. It then operated as an independent station affiliated with the Nine Network in the Eastern States. This meant that STW9 had preferential access to the Nine Network programs, but would maintain the ability to place these programs to suit their ‘local’ format. … the rubbish, the capitalising of interest, the deferring of debt and so on, I think, had the Canadian press baron Lord Thompson, told Frank Lowy [Westfield Shopping Centres] Christophe Skase or Alan Bond – as he did tell his colleagues on winning the Scottish Television franchise – that this business is a licence to print money, they would have thrown him out of their boardrooms. The winners seemed to be the big banks. Alan Bond said that there was no necessity for the Banks to destroy the Bond Corporation and that it was due to greed on their part. The assets that they seized in foreclosure were subsequently sold at highly inflated prices and much more than was necessary to cover the debt. With the demise of the Bell Group, TVW7 became an integral part of the Seven Network. Nineteen-ninety saw a major change in the way that Ratings results were disseminated. The hard-copy books were replaced with electronic print-out which immediately delivered the daily results. The format was reduced to times and percentages with only primary word references to programme names. Analysis and guides such as the Top Twenty were left for the subscribers to ascertain. In the 1990s the progressive battle which occurred between TVW7 and STW9 was not duplicated with the introduction of NEW10. Because outside sourced programmes were now the accepted norm, there was no stigma of being a ‘foreign interloper’ to overcome, although indeed, with the sale of the station to the Ten Network that is indeed who they were. This chapter, along with Chapters Seven and Eight, has shown that the area of local ‘live’ production was, in the past, inexorably tied to the financial fortunes of the individual commercial television station. It not only relied on successful advertising policies for its existence, but also helped to create that success by making the station appealing to the viewing audience. This would, in theory, mean good results in the ‘ratings surveys’ and subsequently more advertising income. This in turn reflected the earning capacity of the station. Chapters Seven, Eight and Nine have demonstrated this theorem. 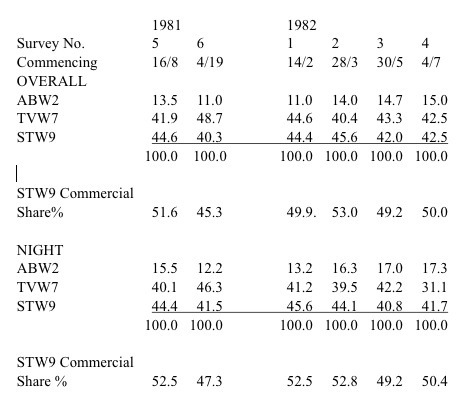 Viewer Ratings Surveys in 1981 showed that STW9 had assumed a place of equality alongside TVW7, financial returns were high and shareholders happy. There was enough surplus monetary growth to provide for investment in the social capital of local ‘live’ production. This all changed before the decade had passed. Both companies would be consumed by vast corporate entities, TVW7 would fall victim to criminal connivance and STW9 would be taken over by a Victorian dried fruit and juice company, owned by one woman. This was made necessary by cross-ownership regulations when Bond Corporation acquired control of the Bell Group which included The West Australian Newspaper. The introduction of a third commercial station NEW10 in 1988 saw limited local ‘live’ production and in 1990 their Production Department was closed completely. An Analysis of Financial Results shows that in 1966 following twelve months of competitive operation TVW7 declared a dividend of 20%. STW9 had a loss situation (reflected in the chopping of local ‘live’ shows) and did not return to investors until 1970 when the maiden dividend was set at 8%. In 1972 TVW7’s return rose to 24% and STW9’s to 12.5%. Due to the outlay on conversion to colour [TVW7 spent 2.5 million dollars] the following year TVW7 fell to 13%, while STW9 stayed at 12.5%. However this was related to the value of their shares having had their value reduced from one dollar to 50 cents. In 1974 the figures were 17% and 11% respectively. 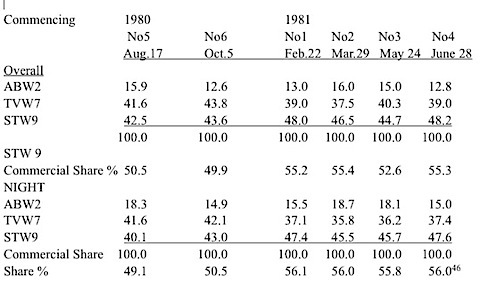 1975 saw the former at 11% while STW9 paid 15%. 1977 saw TVW7 return to 24% and STW9 went up to 16%. 1978 the figures were 26% and 24%. income %. Colour had really boosted television viewing audiences and therefore advertising income and this corresponded with the period of greatest financial outlay on local ‘live’ production. TVW7 paid a dividend of 30% in 1979 and this was matched by STW9. It remained the same for TVW7 in 1980 but STW9 fell to 17.7%. In 1981 TVW Enterprises Limited was taken over by the Bell Group. One of their first actions was to introduce ‘commercials’ to the previously advertisement-free, local ‘live’, 24-hour annual Telethon. Maximisation of profit was the new intention. Returns to shareholders stayed high and STW9 went on to pay 20% in that year. 1982 saw TVW7 still on 30% and STW9 20%. In 1983 the Bell Group did not disclose a dividend figure but profit was $3,991,000. STW9 were still paying 20%. 1984 showed that TVW7 profit was $4,176,000 but once again no other figures as the business was by then subsumed by the Bell Group. In 1984 a similar fate overtook STW9 which disappeared into the Bond Corporation. In 1989 that conglomerate went ‘bust’ and STW9 was purchased by the private ownership of Sunraysia Ltd. In 1988 TVW7 was taken over by the Christopher Skase Quintex group which was placed in receivership in 1989, leaving the station’s majority control in the hands of its major creditors, various Australian Banks. 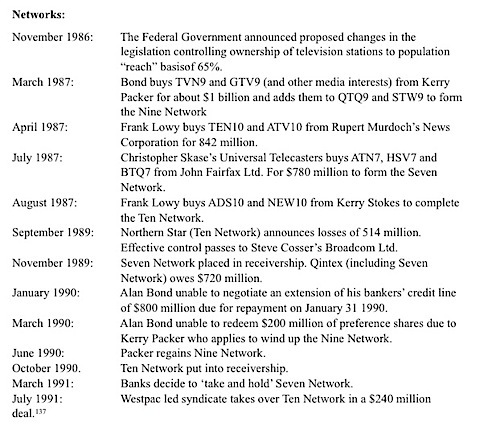 Control of the Seven Network was acquired by Kerry Stokes in 1995.With the advent of tight corporate control, economic rationalism became the controlling factor and money was no longer expended on anything which did not furnish a greater monetary return. The information provided by analysis of the Annual Reports shows why resources for local ‘live’ production were rationed at STW9 during its first ten-year struggle for equality with TVW7. After that both stations fought to be recognized as the leader in all areas, but most importantly in local ‘live’ production, as that represented their attitude to Community Responsibility. Finally, the lessening of financial returns available for local ‘live’ production in the 1980s saw a decline in that area and eventually its almost total extinction. Throughout the period 1965-1988 both television stations expanded into other fields and then eventually contracted. In 1971 TVW7 invested in a feature movie, a television series, a Lion Park, theatrical presentations, colour printing, movie theatres, radio, international ‘live’ productions, food processing and an ill-fated involvement with the Perth Entertainment Centre. STW9 contented themselves with the purchase of a radio station, Drive-In Theatre shares and setting up of a heavy haulage business. The high profit margins were reflected in both stations being willing to spend on local ‘live’ production in many areas, both ‘in studio’ and series recorded on film in the field. The crowning highlights of both became 24 hour continuous ‘live’ local presentations by way of the fund-raising self-aggrandizement of Telethon and Appealathon. When those profit margins contracted, the first area to suffer was actual ‘in-house’ studio productions. While Telethon continued as a successful 24-hour fund-raising event with commercial advertising content, Appealathon was terminated. If The Main Event is likened to a boxing match, then the Australian Broadcasting Control Board is the referee and the viewing audience are the judges. The judges’ verdict is given per medium of the survey ratings system. By 1979 TVW7 was feeling the pressure from STW9 and declared that they had won every industry ratings survey over their twenty years of operation. 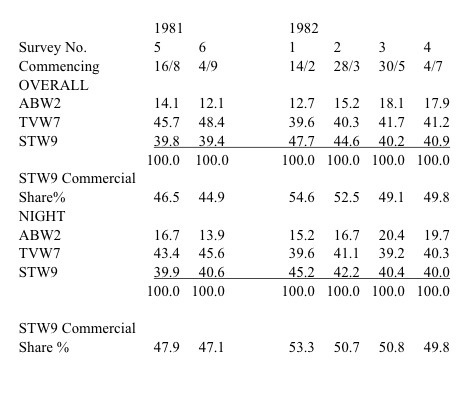 In 1981 STW9 said that their ‘commercial share’ was greatest in five out of six surveys and in both 1982 and 1983 the claimed four out of six wins. By the end of the decade the original two commercial stations would have another competitor, which would eventually lead to an almost identical three-way split of the viewing audience. The times they were a’changing! If this does not work, you may need to click and hold (Mac) or right click on the link (PC), then choose “Download to Disk,” “Save Target As…,” or the equivalent.